Posted by judylobo in Animal Video, Baby Animals, Big Cats, Mammals, Nature, photography, Snow Leopard, Wildlife, Zoo. 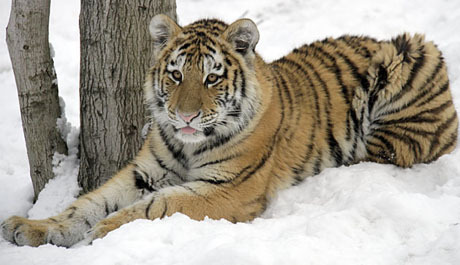 The lure of freshly fallen snow and seeing three eight month old tiger cubs frolicking was too much for us to ignore. So we hopped up to the Bronx Zoo yesterday and had a snow-sational time. Don’t forget to watch the tiger cub video below today’s snow montage. Zootastic! They look much happier in the snow than most New Yorkers looked last week! These are fantastic. I especially love the contrast of color between the tigers and the snow. All the animals look like small children enjoying a snow day! So cute! Even as tweens! We’re due for some snow here this week, i’m inspired to go check out my local kitties at the Stone Zoo! More snow is coming our way this week and I am sure the lure of freshly fallen snow will get me out to another zoo to watch all of the fun.